A cute camera unlike anything I have seen so far. According to my contact, it is being marketed toward children, "See what I See?" A good idea in my opinion. I would recommend this camera for children between 4 and 9 for showing the grand parents their latest art work or bo bo on their finger. Older folks may find the camera convenient for shooting pictures of objects to be e-mailed to others. The camera should work quite well with most IM programs. The camera is shaped sort of like a pen which can be hand held and pointed where you want it. Many of the other cameras can do the same thing but not as easily. The PoV has a manual focus and can be focused down to a little under 2 inches. However, in dim light the depth of field in close up mode is fairly narrow so you have to keep the camera at a steady distance from the object you are shooting. In brighter light this isn't quite as much of a problem. It does come with a double function mount which allows the camera to be clamped to a notebook screen or stood up on a desktop. Nice design but the instructions are a bit difficult to understand. You have to slide the clip mount into the desktop stand in a specific angle then mount the camera on a pin that sticks up from the clip mount. In bright light the images are good but I did notice some difficulty in wide brightness ranges, some over exposure on the brightest areas. The camera works in very low lighting levels, but the image is not very good. But this camera performs very much in line with most other cameras within the same price range. The one major issue I had was with the drivers. After installing this camera, I had major problems running any other camera on the same computer, even after uninstalling the VoP software. I had installed the software on two different computers and ended up having to rebuild both before I could use other cameras without my TinCam program crashing. I wouldn't try using this camera on a computer that you expect to use a different webcam on. Another issue, although minor for most users, is the camera seems to use more computer resources when you set it for smaller image resolutions. It would appear that the image is being resampled down inside the computer to achieve a smaller size. Most cameras use less system resources when a smaller image is selected. I probably wouldn't have noticed this except the first notebook I installed the camera on was a number of years old and not as powerful as the second computer I used. 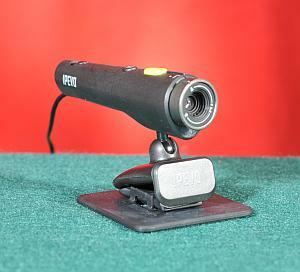 The camera can be purchased from IPEVO on their website. I have not seen it in any stores at this point.